- Remeltable and Reusable Mouldmaking! NON TOXIC, MICROWAVEABLE, AND REUSABLE OVER 35 TIMES! 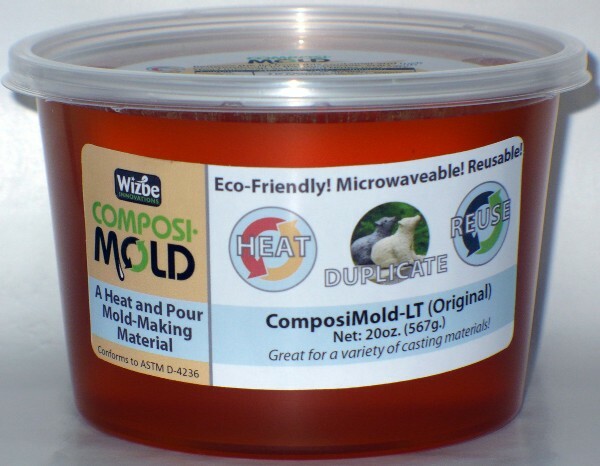 ComposiMold is a 100% reusable mold making material that works by melting and pouring. Many casts can be made using the same mold. Unlike silicone, with ComposiMold you can remelt the mold to make a new, unique mold. ComposiMold is good for the mold maker and craft artist because it can be reused to make different molds without worrying about wasting mold making material. ComposiMold is an excellent material for those wanting to learn and become involved in sculpting, modeling, and mold making without having to worry about mistakes or wasting material. ComposiMold is a flexible, rubbery, thermoplastic that is great for small mold parts using many different casting materials including plaster, silicone, cement, epoxy, polyurethane, and many others. ComposiMold original conforms to ASTM D4236, Safe as an art material.